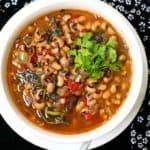 A perfectly seasoned Instant Pot Spicy Southern Black Eyed Peas Stew is a great way to end a good year and begin a great new one. Serve this with a bowl of rice or crusty bread. A vegan, nut-free, gluten-free recipe, can be soy-free and made without any added oil. 1 tsp avocado oil (or any vegetable oil). For a version with no added oil, use 1/4 cup vegetable stock to saute. Set the Instant Pot to saute and add the oil or 1/4 cup vegetable stock for an oil-free version. When it's hot, add the onions, celery and green bell peppers along with the garlic and salt and black pepper to taste. Saute for a couple of minutes. Add the tomato paste along with the thyme, Cajun seasoning, roasted red peppers, mushrooms, kale and soy sauce and mix well. Add the black eyed peas and the vegetable stock. Give everything a good stir and add more salt and ground black pepper if needed. Place the lid on the IP and set it to the "chili" function. When the stew is cooked, you can either release the pressure manually after 10 minutes, or leave the IP alone until all of the pressure has released. Check for salt, and add more if needed. Stir in the parsley if using. Serve hot with crusty bread or rice.